Sony officially unveiled the Sony Tablet P at IFA last August, but we have yet to see it here in the U.S. despite its release in other parts of the world. For those of you that don't remember, this unique tablet features two 5.5-inch LCD displays that fold over one another much like a Nintendo DS. What's neat about having two individual screens is that you can use use them for different functions simultaneously, so multitasking is a bit easier. Naturally, you can also combine the two screens into a single display, but personally I think the seam between the two would get in the way. For those that are interested, the Sony Tablet P will be available through AT&T starting on March 4th. The price will be $399.99 with a two-year service agreement, and will operate on AT&T's HSPA+ '4G' network (yeah, no LTE). In addition to having access to the Android Market, users will also be able to download apps that have been optimized for the dual-screen directly from Sony's "Select App" market. It also has full access to Sony Network Entertainment services, which is pretty nifty. For additional information check out the full press release below. DALLAS, Feb. 28, 2012 /PRNewswire/ -- AT&T* today announced Sony Tablet™ P, a dual screen, multi-functional tablet ideal for mobile communication and entertainment, will be available beginning March 4. The 4G tablet will be sold for $399.99 with a two-year service agreement in more than 1,000 AT&T company-owned retail stores and online at www.att.com. The new Sony Tablet P pushes the design of a tablet even further by elevating the user experience to entirely new levels. The unprecedented dual-screen layout of Sony Tablet™ P allows its two 5.5-inch displays to be used for different functions such as playing video on one screen while using the other as a controller, or checking email on one screen while using the other as a keyboard. Customers can also combine the displays into a single large screen and its unique folding design means it can fit easily into a pocket or purse. At launch, users will be able to download apps optimized for the dual screens of Sony Tablet P via Sony's "Select App," including games, entertainment and lifestyle applications. In addition to optimized apps, Sony Tablet P users will have access to the full suite of Android applications via Android Market. Like its predecessor, Sony Tablet P is PlayStation™ Certified and provides access to the full suite of Sony Network Entertainment services. 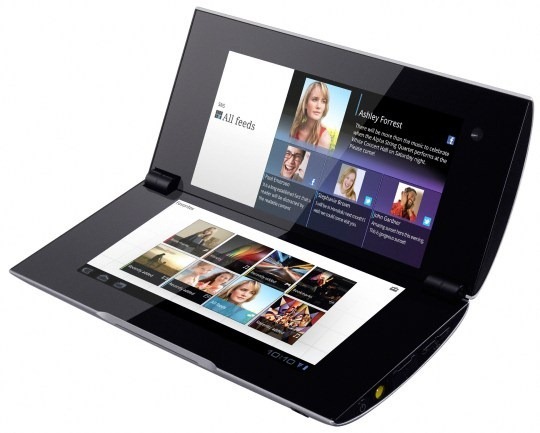 Sony Tablet devices are distinguished by four key features that set them apart from any other tablets on the market. These include: uniquely designed hardware and software, a "swift and smooth" experience (which includes Sony original features, Quick view and Quick touch), network entertainment services and cross-device connectivity. Running on Android 3.2, Sony Tablet™ P is 4G**capable and Wi-Fi compatible. With a qualifying data plan, users of Sony Tablet™ P also have access to AT&T's mobile broadband network and unlimited access to AT&T's nearly 30,000 hot spots nationwide. With both 4G and Wi-Fi, customers can browse the Internet, access digital content including videos, games, and check e-mail, while on the go, nearly anytime. Customers may still choose from the existing monthly billing options, or prepaid options, with no long-term commitment. The Sony Tablet P without a long term contract will cost $549.99. For more information on AT&T, please visit www.att.com. **4G speeds delivered by HSPA+ with enhanced backhaul. Available in limited areas. Availability increasing with ongoing backhaul deployment. Requires 4G compatible device. Learn more at att.com/network.